Dar El Kasbah Location. Book Dar El Kasbah Today with Hip Morocco - Holiday Accommodation in Tangier, Assilah & Chefchaouen, Morocco. 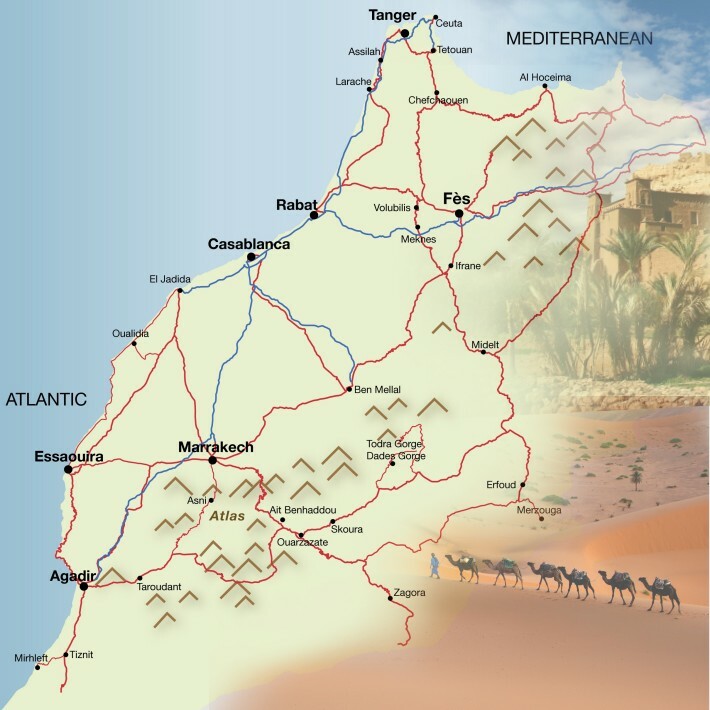 "The first telegraph station in Africa, retaining its English regal heritage"
Tangier: With a prestigious vanguard history being the first telegraph site in Africa connecting the continent with Europe, Dar El Kasbah still retains a rich regal prestige. In 1884 Britain, with its development of the telegraph, the Eastern Telegraph Company connected Tangier and Gibraltar by a telegraph cable. They built the present building of Dar El Kasbah to set up their offices and accommodate their guests. Located just outside the medina and Kasbah of Tangiers along a picturesque market street, Dar El Kasbah offers guests a subtle colonial experience in Tangier. The owner and managers are very friendly offering personal advice on the best of Tangier from their childhood home town. Dar El Kasbah houses a large courtyard on the ground floor with sun loungers and seating areas covered by wooden trellis. The large roof terrace is nicely presented and has a panoramic view out over the city and medina walls, well suited for a romantic evening aperitif before venturing to some of the nearby best restaurants in Tangier. Rooms at Dar El Kasbah are spacious and lightly furnished with thick wooden furnishings, in keeping with the English heritage. Dar Kasbah offer a traditional Moroccan 3 course set menu for 132 Dirhams (12 euros) with a choice of salads, tajines, couscous and Moroccan deserts for all palates and diets. Friendly owner Belhadj Mohamed has created the charming seafood restaurant Le Saveur du Poisson with a inventive menu of healthy dishes and fresh juice drinks at a well priced set menu of around 10-15 pounds per person. The conspicuous front to Anna & Paolo adds to the cosy authentic Italian interior of this restaurant in Tangier. Diners are presented with a wide range of classical italian dishes with a large seafood influence. A perfect romantic restaurant in Tangier with a friendly team of waiters. The French chef of La Fabrique has created a beautiful menu of traditional french gastronomic cuisine crafted for intimate romantic fine dining. Somewhat limited for vegetarians, the trendy interior of La Fabrique and ground floor bar/ Lounge makes this restaurant in Tangier a must visit on your stay in Morocco. "The building is renovated to a high standard and is a piece of history being the first telegraph post in Northern Europe. The owners and staff are all very proud of this building and made every effort to inform us about the history. The breakfast was beautifully served on the terrace which is clean and spacious like the inside of the hotel. This hotel offers both comfort and convenience like many but the service was perfect and we will stay again soon. The souk is on the doorstep and everything is within walking distance even the beach. The Hamam opposite the hotel is a typical (none tourist) bath house which is a must but not for the feint hearted." "Had a great stay here, Noam and all the staff were extremely heplful and friendly - nice clean rooms - fantastic location - great breakfast - good wi-fi -hotel is right in the busy Rue el Kasbah. Would definitely stay here again - Thanks Noam"
Situated on a picturesque market street leading from the medina and main square up to the Kasbah entrance with its views over the Tangier bay and the Spanish mountains in the distance. Dar El Kasbah is a 20 minute walk, through some interesting areas of the city, to the beach or short taxi ride. The double rooms at Dar El Kasbah can host a double bed or twin. These cosy rooms have high victorian style ceilings and designed in a small boutique hotel style. The tall thick wooden beds create a grand regal atmosphere. These rooms have either garden or street views from their window. The double rooms come with plasma screen and satellite. The bathrooms are cosy with a plastic cased shower cubicle and large wall mirror. A room well suited for a simple yet beautiful stay in Tangier. The superior double rooms at Dar El Kasbah can accommodate a double bed or twin beds. Larger than the double rooms, the superior doubles have air conditioning and dark wooden floor panels, a dressing table with large Moroccan style mirror and plasma screen with satellite. The window opens onto either the picturesque street below or Riad gardens. The bathrooms have a large shower with plastic cubicle door alongside checkered wood ceiling and cream tadelakt walls. These suites at Dar El Kasbah are spacious and simply furnished in a small boutique hotel style. The tall wooden double or twin beds sit alongside the Spanish colonial styled white window shutters and long curtain drapes. These rooms are decorated with contemporary African art and have an inroom spacious salon with thick wooden armchairs and table. The large bathroom has a shower cubicle with large black metal wall mirror and wooden trellis ceiling. The bathroom windows look onto the street or Dar El Kasbah gardens. These large quadruple rooms at Dar El Kasbah have 1 double and 2 twin beds perfectly suited for a family holiday in Tangier. This room is layered with dark wooden flooring and window views onto the street below or Riad gardens. The bathroom is spacious with shower cubicle and single sink with large black metal wall mirror. A room suited for a group stay in Tangier or family. The base rate price at Dar El Kasbah is in pounds, euros, or Moroccan dirhams and exchange rates are approximate.